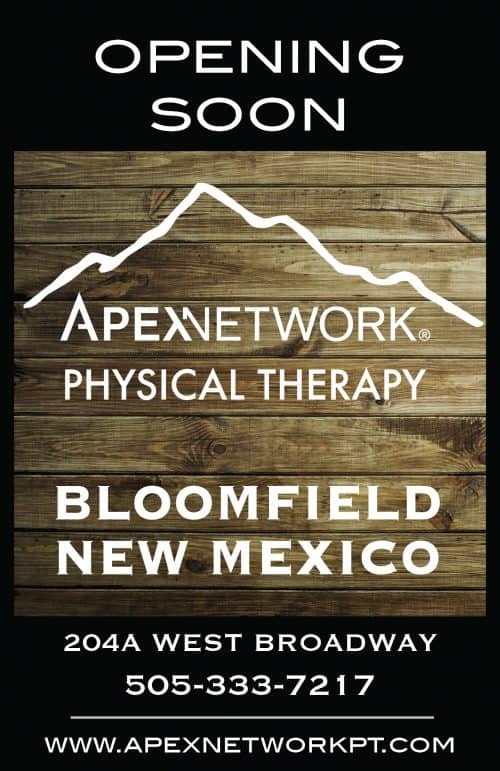 ApexNetwork Physical Therapy is expanding in New Mexico! Our newest clinic will open in February this year in Bloomfield, NM. The clinic joins the Gallup and Bernalillo locations in New Mexico and over 50 locations nationwide. ApexNetwork Physical Therapy strives to provide the highest quality physical therapy; assisting people of all ages and occupations to achieve their goals, perform at their highest level and excel in health. The Bloomfield clinic will offer physical therapy, sports rehab, industrial rehab and manual therapy. We look forward to providing exemplary rehabilitation services to Bloomfield and the surrounding community! To learn more, please call 505-333-7217 or visit www.apexnetworkpt.com. Keep an eye out for future updates for the clinic opening!